Rexxar is a unque warrior that plays nothing like any other character in Heroes of the Storm. He attacks from range and commands his trusty bear, Misha, to attack with him. Almost all of his utility (as well as a portion of his damage) is tied to her and because of that, you need to micro-manage her movement and actions. If Misha dies, you'll lose a great deal of your ability to attack opponents or defend your allies. I would also add that Rexxar is particularly challenging to play because Misha can be difficult to control well and if you're the only warrior, she isn't exceptional at defending players. 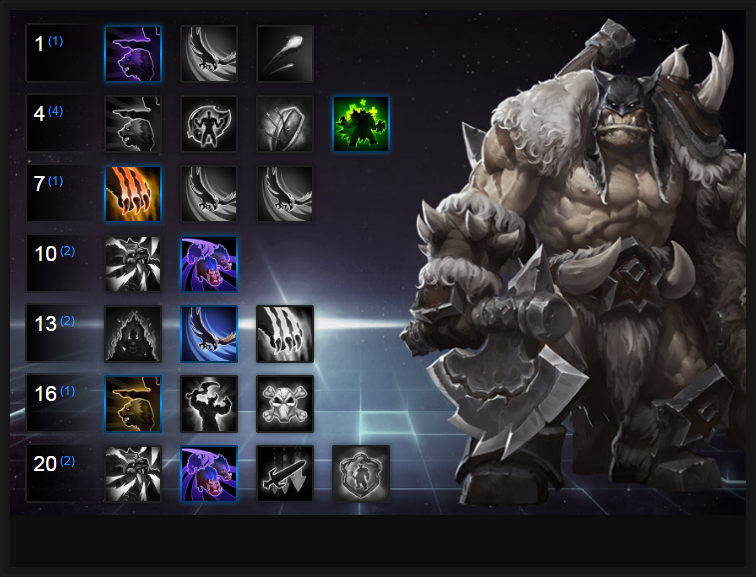 As a bruiser however or off-tank, Rexxar can be very strong in the right hands. Misha (Trait) - Rexxar's trait has three commands: "Misha, Attack! ", "Misha, Follow!" and "Misha, Focus!". All three provide ample control over you automate her with attack and follow directly linked to (D). Pressing it alternates between her states. "Misha, Focus!" allows you to directly target who Misha attacks and she will chase them down until she overextends or is commanded otherwise. I would highly advise that you utilise "Misha, Focus!" the most as it provides the highest level of control over her unlike the others (which are largely passive). Be sure to use "Misha, Focus!" to have her scout bushes, guard a location or to generally make a nuisance of herself. Spirit Swoop (Q) - Rexxar's ranged snare allows him to slow all enemies the bird strikes. It doesn't deal enormous damage, but it provides reasonable pressure and allows you to land your auto attacks easier or your "Misha, Charge!". It's range is fairly generous though its telegraph is narrow. Fortunately the bird flies out quickly allowing you to easily most enemies. Be aware that Spirit Swoop early game is mana intensive and its slow lasts only 2 seconds. If you can, use it after you've stunned an enemy so they're slow to escape. Misha, Charge! (W) - Dealing damage to all enemies in a line and allowing your bear to stun those that she hits, Misha, Charge! is key to Rexxar's playstyle. It's invaluable during a team fight and later on, Misha, Charge! can have its cooldown significantly reduced as your bear auto attacks. Used against an enemy trying to escape, or to protect an ally who is being attacked, it's invaluable. I will say that Misha, Charge! can take some getting used to as you can still nagivate Rexxar and it has its own independent telegraph. Well worth practicing in Try Mode. Mend Pet (E) - Doing exactly as it says, Mend Pet provides Misha with a considerable amount of health over 5 seconds. Due to the fact that it's a heal over time you need to factor in when you think Misha will take damage because if you lose it too late, she'll die and you'll be left vulnerable. Always try to keep her health topped up as much as possible but be conscious of the mana cost. Beastial Wrath (R) - Boosting Misha's damage by 150% for 12 seconds, Bestial Wrath allows her to deal some serious damage. Unfortunately Misha can die easily and if she does, you'll gain very little from Bestial Wrath. That said, if you can keep her alive and land your "Misha, Charge!" and slow from Spirit Swoop she'll be able to make good use of it. Alternatively, it's also fantastic for allowing you to solo any boss quickly. Unleash the Boars (R) - Unquestionably the best Heroic for Rexxar, certainly for team fighting, Unleash the Boars allows him to send our a herd of Boars at the enemy team. With a huge range and with one Boar per enemy in its radius, it will reveal and slow all enemies struct by 40% for 5 seconds. In a team fight, that's a lot of instant crowd control and invaluable against the likes of Valeera or Nova. The slow is considerable and really allows your team to snowball. Misha is 90% of Rexxar's utility and a good portion of his damage. Without her, he'd be incapable of clearing camps and Easy Prey makes him a machine at solo-clear from level 1. Boosting her damage against Mercenaries to 150% and increasing her armor by 50 against minions and mercenaries, it allows you to comfortably solo bosses and take on any camp. Variable: Flare is a good alternative if you need vision whilst in lane or during an objective heavy map. Rexxar will rarely die unless he is so badly positioned that it's avoidable (which would take some doing). Animal Husbandry is an amazing and unique talent that grants Rexxar and Misha 2 maximum health for every second he's alive. After 20 minutes that's an additional 2400 health, bringing him and Misha to well over 6,000 by level 20. The catch is that the bonus is lost if you die, so be sure to have Misha take the fall so you can escape. Variable: Grizzled Fortitude is a good alternative as it allows both Rexxar and Misha to gain independant block stacks (up to a maximum of 2 each) that reduce incoming basic attack damage by 75% per shot. Against a basic attack heavy team, it will elongate the life of Misha - at the very least. Misha's charge is a key skill as it allows you to interrupt multiple enemies at once. Having Misha's auto attacks reduce the cooldown by 1.5 seconds per basic attack, thanks to Aspect of the Beast, means you can use Misha, Charge! much more often. It's a must-have talent. Unleash the Boars is incredibly potent but it's best used when there are multiple enemy Hero's in front of you. Its width and range is absolutely massive but it scales based on the number of Heroes. If there's only one enemy, only one boar will appear. The fact it reveals and slows make it great for pursuing enemies trying to escape. Try to use it so the boars will arrive on impact quickly (rather than travelling far) so that you gain maximum use of their slow. Variable: Beastial Wrath is a great alternative on large Battlegrounds that require Rexxar to be alone, where there are opportunities to snipe camps and solo bosses. On Battlegrounds such as Braxis Holdout it's also invaluable as it ensures you can win almost any 1 on 1 fight. Providing you with 100% attack speed for 3 seconds after landing Spirit Swoop, Aspect of the Hawk is a huge boost in damage output for Rexxar. It also means you can comfortably pressure squishy targets for a brief period while Misha stuns them. Considering Spirit Swoop only has a 7 second cooldown, it's fairly easy to maintain. Best of all, Misha's basic attacks extend the duration. Both Rexxar and Misha aren't agile so taking Thrill of the Hunt to trigger 25% movement speed every time you use basic attacks is fairly significant. It prevents players escaping, allows you to move easier and escape if needed. Variable: Feign Death acts similarly to Ice Block in the sense that it allows Rexxar to become invulnerable for a period of time. During it you can control Misha allowing you to deal some extra damage whilst you by yourself some time. Just be aware that skilled players who are already pushing forwards will just wait for you to get back on your feet. Boosting Rexxar's Ultimate ability so that they now deal 50% more damage is significant but it's the root for 1.5 seconds on Kill Command that makes it so valuable. Considering its range, it's amazing crowd control. Variable: Both Rexxar and Misha are pretty squishy. They really can't survive for long periods like Johanna or Muradin so taking Hardened Skin allows you both to withstand some punishment during late game. These Hero Threat Levels (1 being lowest threat and 10 being highest threat) are to help you determine which enemy Heroes can give you a headache. Any Heroes that aren't on this list are easy pickings for Rexxar. If a Hero is listed here, take greater care. Illidan: His mobility combined with his shielding/evasion make him a real nuisance. He can also use Misha as a means of escaping easily either if he extends too far towards you. Kerrigan: Her stun, pull and self shielding mean she can burn Misha down quickly and turn her attention to you. Be careful. Nova: She can nuke Misha down nearly instantly and turn her attention to you. If she takes Tripple Tap, you're in trouble. The Butcher: His health regeneration from Butcher's Brand combined with Lamb to the Slaughter mean he can tie you down and comfortably ignore Misha. Zeratul: Similarly to Nova, his ability to burst from cloak means that at the very least you'll be without your bear (repeatedly). This list of tips and tricks are just a handful of things we think will help your Rexxar play. We'll continue to add to the list as required and if you have any tips you'd like to share, let us know in the comments below and we'll place them here. 1. You must, must, must actively manage Misha through your trait. If you don't, she'll die far more than she should. 2. Misha's actions are linked to yours so if you're attacking someone and retreat (or turn away from your foe) Misha will come back to you. 3. Remember to use Mend Pet slightly early to offset incoming damage otherwise Misha will die before the heal truly kicks in. 4. Although you're a ranged warrior, it doesn't mean you can't still body block for your team. Make use of yours and Misha's size in small areas. 5. Spirit Swoop combined with Misha, Charge! is a high amount of crowd control that can effect multiple enemies. Try to maximise their use during team fight by hitting more than one target. 6. You should be capitalizing on the fact that Rexxar can comfortably secure any camp and boss at a very early stage. If you can, regularly sneak off and ninja steal a boss. 7. If you've taken it, try to use Flare as often as possible to provide vision in locations that is needed. In heavily shrouded battlegrounds such as Dragon Shire, it's invaluable. 8. Remember to use Feign Death (should you take it) to avoid big damage spikes or to buy you time whilst your allies come and help you. It's great at defending against Heroes such as Nova or Zeratul. 9. Rexxar has very low health for a Warrior so try not to face tank - let Misha do that. It's only at late game do you get a reliable means of boosting your defence. 10. Unleash the Boars followed by Flare is an amazing way of keeping track of Nova or Zeratul. Make sure your team uses it to hunt them. 11. Try not to die once you've picked up Animal Husbandry. The health boost to you and Misha is enormous and you want it as high as possible by late-game. 12. Always try to use Misha, Charge! against high value targets so that they can be focused by your team. Alternatively, use it to protect an ally being focused. 13. On Battlegrounds that require objective interaction, be sure to have Misha scout ahead (using your command) so that you get early warning. You can also have her stun players if they begin to walk towards you - while still capping the objective.